The competition day became the longest and very diverse: a para- athletes showed incredible strength of spirit, and master athletes - an excellent level of training and real mastery! 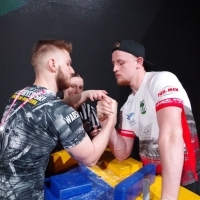 Among the participants of the para-armwrestling championship there were teams from Russia, Ukraine, Blarus, Azerbaijan, Kazakhstan, Poland, Romania, Uzbekistan, Turkey, Bulgaria, India, Hungary, Georgia, Costa Rica and other countries. In general, the day was hard-fought and emotional, there were a few rematches in the finals. One of the most memorable was a duel among ladies with a visual impairment in the weight category of 60 kg, when it appeared that the athletes were not fighting, but their coaches, who suggested what to do. In the team result among athletes with disabilities (ladies) the third place was won by Poland, the second - by Ukraine, the first - by Russia. The third place in men class belongs to Ukraine, Georgia the second, Russia the first. The fight of the category of masters was really amazing. In one duel these sportsmen managed to show almost all the tactical and technical arm-wrestling arsenal, so you really can say: it's not power, it's experience. Several points worth noting. For example, Raimonds Antonovics became the second on the right hand, despite the fact that comparatively at the European Championships he was second only after Yevgeny Prudnik. Spectacular struggle was among the representatives of Great Britain and Germany in the category of 100 kg among grandmasters - it created the feeling that you are watching a film. In general, competitions among masters were filled with positive and after each victory the athletes warmly congratulated each other, and the hall also did not skimp on support. According to the team scores among female masters, the first place was won by the United States, second by Russia, the third place by Poland. The men team scores^ in the first place - Russia, the second - the US, the third - Norway.